"The film Momentum breaks the Canadian stereotype and uses the latest technology to do it." A gigantic Canadian icebreaker slams through the solid ice and moves directly towards the camera with massive force. White particles are moved aside by this massive forced created by man. One moment later, we're floating above the stunning and vast landscape, far above the ground. 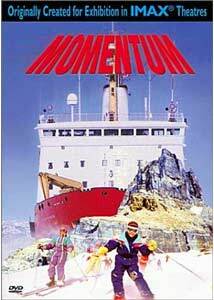 Momentum offers a remarkable collection of this sort of quick moments and attempts to convey the heart and soul of our northern neighbor. Through the remarkable IMAX technology, Canada comes alive via its cities and into its wide expanses of natural life. Originally premiering in the Canada Pavilion at the World's Fair in Seville, this 20-minute film uses images and sound and avoids any narration or interviews to showcase the country. Produced by the National Film Board of Canada, it presents the typical skiing, icy mountains, and still other, expected shots. However, we also observe moments within the large cities and cultures not usually associated with this land. The most telling example of this difference is a scene of men draped under a Chinese dragon within the metropolitan streets. While only a small moment in a larger tale, this inclusion reveals the filmmaker's efforts to go beyond the usual images. The highlights give us an intimate perspective of events usually witnessed from afar on television. We glide above impressive cities like Montreal and Toronto and are able to view their charms. The skiing scenes exceed our expectations by having the camera moving right with the group. Kids fall rather violently only a few feet from us, which helps to create a "you are there" feeling. This tone also resonates while riding the dog sleds rapidly along the frozen land. Even the shots of ice-skating�one of my least favorite sports�work nicely, because we are skating right there with the graceful athletes. The movie also showcases Canada's wildlife by presenting birds and bears frolicking close to the camera. Momentum moves at a breakneck pace and abruptly concludes far too quickly. Twenty minutes is not enough time to achieve the lofty goals of the directors. The smooth feeling to the entire production does occur due to the fast jumps through each scene, but extra time would have been refreshing. An interlude in the middle features an Inuit woman creating an interesting painting, but it passes so quickly that the resonance is lessened. This film avoids the distractions that sometimes sink IMAX films and provides a rewarding experience. A longer running time would only have enhanced these remarkable images. Image Transfer Review: Momentum appears in an adequate full-frame transfer that obviously suffers from the transition to the small screen. Unlike recent IMAX releases like Journey Into Amazing Caves and Dolphins, this feature does not offer the same high level of clarity. Its age obviously shows with a decent amount of grain and some edge enhancement. The outdoor scenes still convey impressive colors, but the overall picture falls short of its more recent counterparts. Audio Transfer Review: The lack of a 5.1-channel Dolby Digital transfer lessens the impact of this engaging picture. The raging waterfalls and monstrous icebreaker would gain considerable power with more complex audio. The 2.0-channel stereo version still packs a good punch and nicely conveys the classy score, but it still is a significant disappointment. The sounds are clear, but they lack the extra force needed to really carry the images. Extras Review: Momentum's lone extra feature is a six-minute featurette that provides a quick behind-the-scenes overview of the production. It offers some awkward narration concerning the film's purpose, and also gives us a few insights into the complex IMAX process. The menus appear out-of-date and very simple, with only two choices and no chapter cues. This is definitely a bare-bones release. Image has done the minimum amont of work in presenting Momentum�a brief, impressive IMAX feature. The menus seem to have been created in five minutes, and the lack of chapter selections on them is also frustrating. This release is probably worthwhile due to a low list price and some memorable images, but the poor treatment makes it less attractive.